Next to the shield that carries the Spanish flag should also appear a succulent dish of patatas bravas , without leaving anyone speechless. 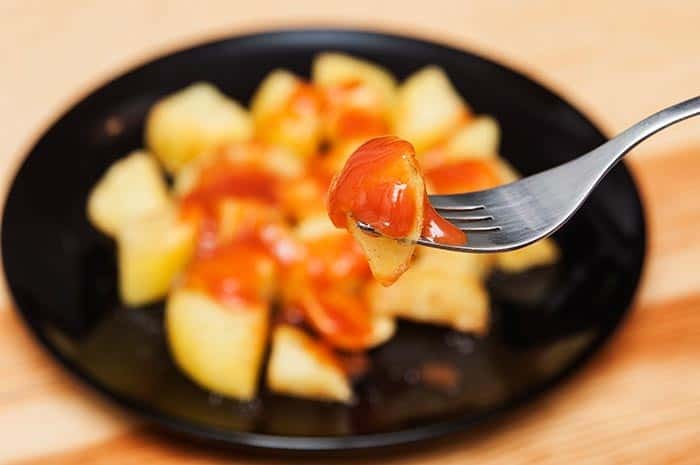 The so-called "bravas" comprise one of the most emblematic tapas portions of Spanishness and therefore should be a subject of conscientious study in the curricula of Spain. But as it is not, with all the seriousness that the case requires we will teach you right now how to make patatas bravas . Its physiognomy: chips cut into medium size so that each snack is perfectly suited to the palate of the diner, very much to the Spanish, because in a sovereign way they resist copying the ultra expanded sticks of fried potatoes. His soul: a generous bath of brave sauce , magical, juicy red-orange tones that we could compare with the same Iberian blood and that, if not for it, the rations of Spanish potatoes would not be more potatoes served anywhere in the world. Then pour them in a saucepan containing the liter of water and let them boil for five minutes. 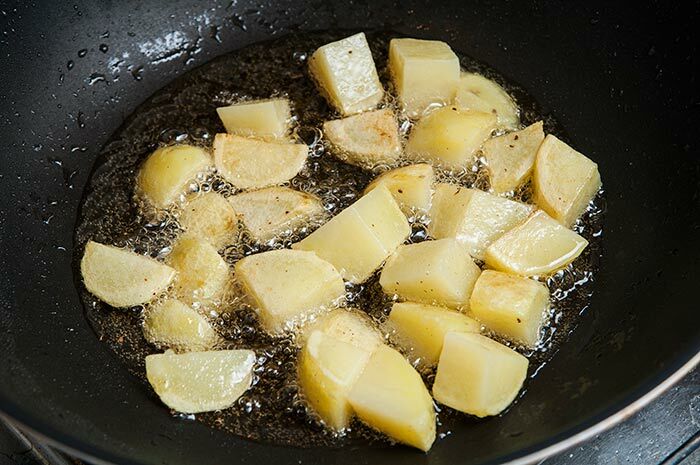 What you are looking for is to extract the starch from the potatoes and to soften them just a little bit, leaving them al dente, but never cook them completely, because they will finish cooking when you take them to fry. After five minutes remove them from the hot water and wet them for a few seconds under cold tap water, thus stopping the cooking. Drain them and let them cool enough so that you do not activate an atomic bomb when casting on hot oil. We all know what happens when we mistakenly drop water on oil at high temperature, right? Ok.
Heat the olive oil in a pan, which is so much oil so that the potatoes are well soaked and receive heat on all sides. Immerse them in the oil over medium heat for five minutes to finish cooking and softening, and then let them two more minutes over low heat to brown them just a little. Stir them together so that they are well fired in the oil. Parentheses: if you have a fryer, oh là là, you are God and you have it more than easy, almost automatic. Now ... tararááán! The best part of all: to bathe them sensually with the picantosa sauce that you will have ready after having followed step by step our recipe of how to make salsa brava.They are robust and go well with dishes cooked in the oven. Another idea is to sprinkle them with a light rain of oregano or with a light rain of fresh parsley, before and after spreading the brava sauce over them. 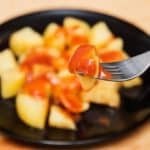 There are also those who give the patatas bravas a little sauce alioli or a bit of cabrales sauce, and of course, there are those who put the three of them, thus achieving a mixture of flavors that make the taste buds delirious. Speaking of tapas with potatoes and the infinite It's the Iberian food in general, have you prepared your own broken eggs? And, tell us, how much have you eaten in this essential list of 100 Spanish dishes that you should try before you die? Easy and delicious, learn how to prepare the famous patatas brava, step by step.Put them on absorbent kitchen paper so that they lose excess oil. Pass them to a plate, or tray and bathe them with a generous amount of salsa brava.